July 24, 2011 Daily Photo. 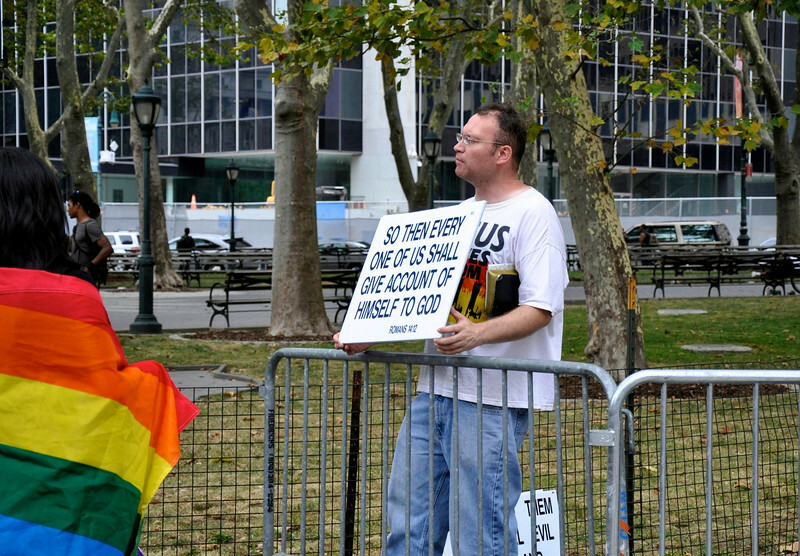 Rainbow flag and lone protestor. Okay, so this photo was up for about 5 seconds when someone posted a comment I found offensive and I deleted it. In case it's not clear, this is a photo of a newsworthy event. I happen to think it's a damn good photo too. Everyone is entitled to their own opinion. However, in case you missed it, I support gay marriage 100 percent, so if you leave a hateful comment, I am just going to delete it. It's my page, I can do that. The church I was raised in taught me not to judge others, lest I be judged. Most importantly, the church I was raised in taught me that the greatest of all commandants is love thy neighbor as thyself. And should you be of the opinion that gay marriage is sinful, then remember that Jesus said let he who is without sin, cast the first stone. Glad that I happened upon this shot today! Wonderful documentary photojournalism..I agree with you, with Art and with others who support your photo and words. I would think that with all the comments today ( I am writing on Sept 11, 2011) and the freedoms we have in this country there should be no negative comments posted ever on a shot like this unless you exposed or cropped or were out of focus...You had none of that in any shape or form. We should only support freedom in our country this is one of many! Thanks for sharing this and your commentary, too! Thanks for the commentary surrounding this shot. I would really commend the cops on this - so often they react to photographers badly. Good shot. Your photo captures the moment, as with all of yoiur photos, great job. Great piece of photojournalism... Bravo for posting it! Also a big Bravo to the smugmuggers who support this photograph, as Art said this is a photography site, not a political one. I leave the judging up to God, that's his job not ours. Look through the eyes of love and you'll never know what hate is. Great photo, and ery newsworthy. You are brave. I think it's a great photo and bravo to the cops! I love everything about this, thank you! I agree with you and I also think this is absolutely a photo that many will want to have in years to come to remember this time.